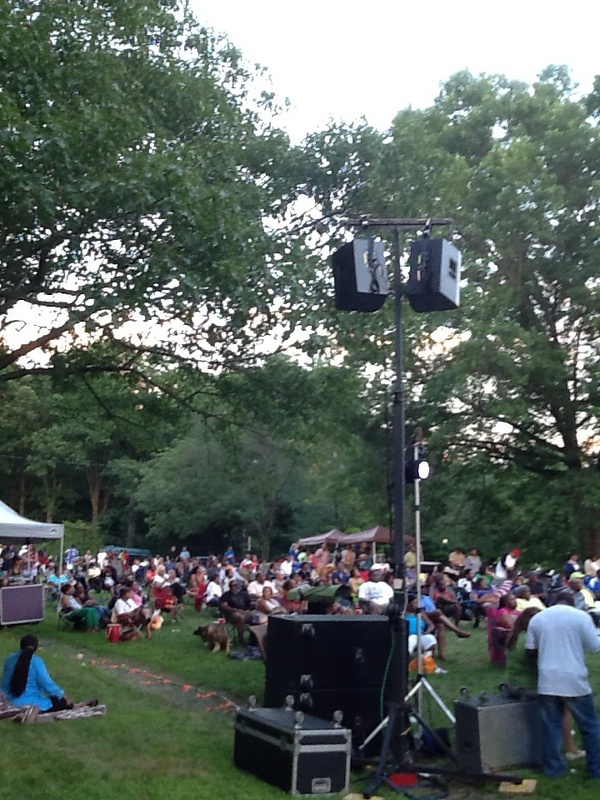 The 2012 Elma Lewis Playhouse in the Park series ended four weeks later with a crowd of people dancing in a warm rain to Ray Greene and his band. It was a wonderful way to end to the concert series … With the heavy rain waiting until we were packing up the truck … Mother Nature’s own sigh of relief it would seem! The buzz that had showed up in the self powered monitor went away with an upgrade to a sine wave inverter … it turned out that a very slight buzz was audible when some of my gear was plugged into either of the modified sine wave inverters that I had started the project with … A very quiet humm or buzz I had thought was “normal” when using a high gain sound system … Plugging any of the “offending” pieces of gear into the new sine wave inverter silenced them! … At least while running off of the battery power. 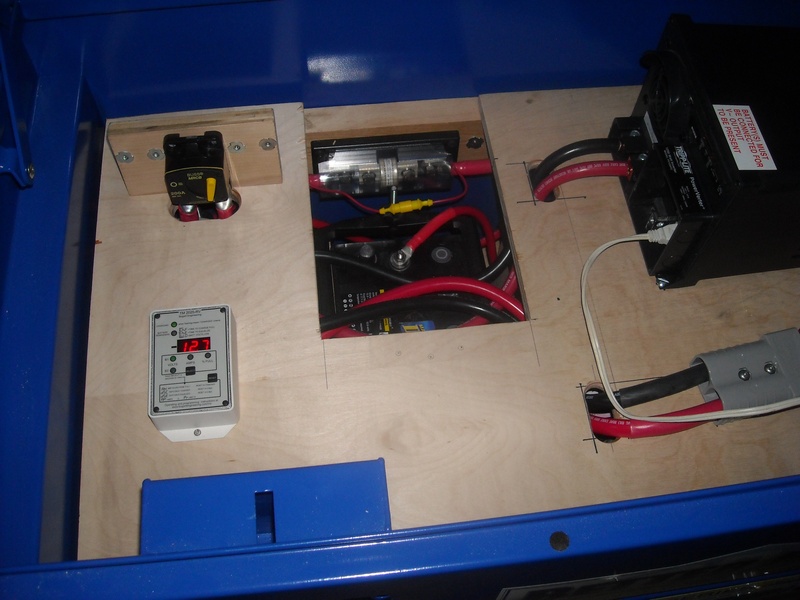 Aside from that buzz the systems worked amazingly well … The “To good to be true” kind of amazingly well … With run times between 4.5 and 6 hours per day … And never coming close to using up the battery reserves … At least according to the inverter’s built in meters. 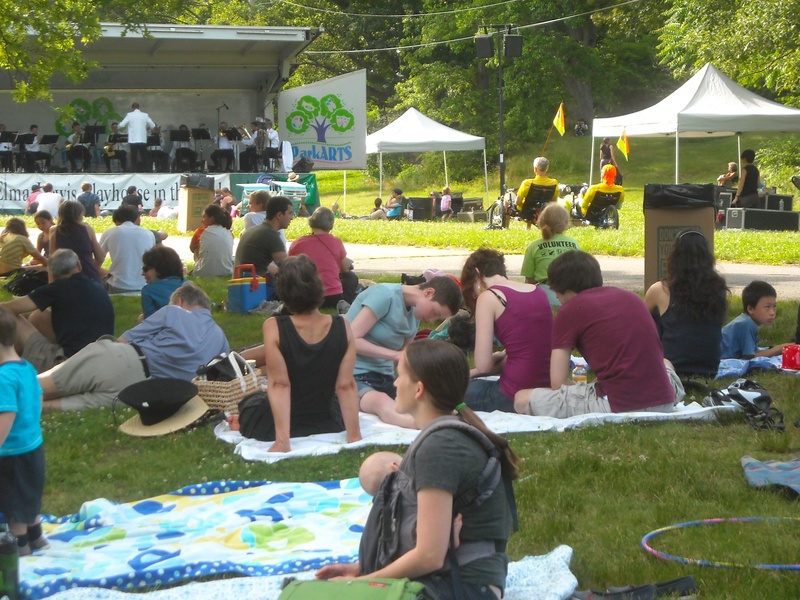 2012 was going to be my second year of providing one of the sound systems for the Reading Street Faire … A wonderful day of local bands playing to the home town crowd on a gorgeous Indian Summer day in early September. The town supplies a gasoline generator for the event and I supply a couple hundred feet of power cord, some cable ramps and a couple of carpet runners to get the generator as far away from the stage and audience as possible. 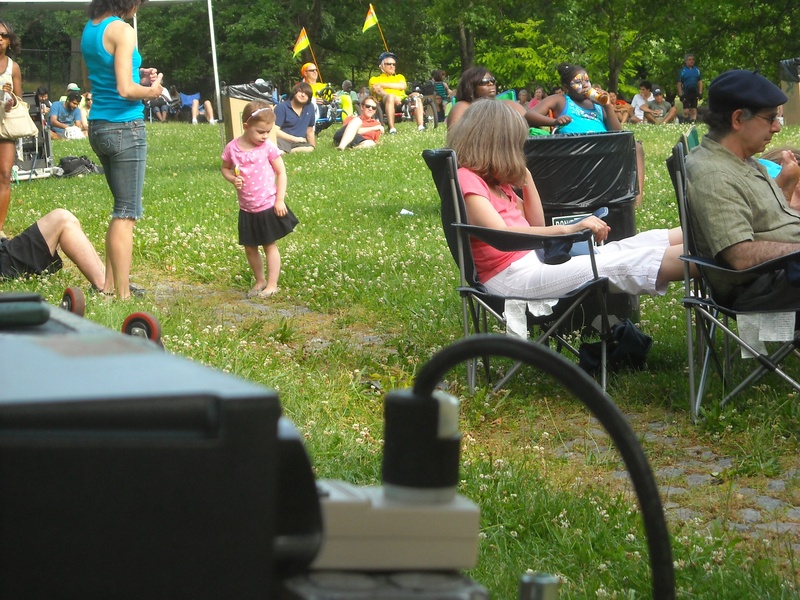 This year I set the batteries up at the stage and had the DPW folks leave their generator … Just in case. My idea was to run my batteries dry … If I could! I brought in the same PA I had used for the event in 2011, a much larger sound system than the one I had used for the Elma Lewis series in Franklin Park. A 12,000 watt sound system … Two pairs of three way concert speakers, two pairs of subwoofers, six stage monitors … plus all the band’s amplifiers, pedal boards … even an electric keyboard or two … Rock and Roll stuff! 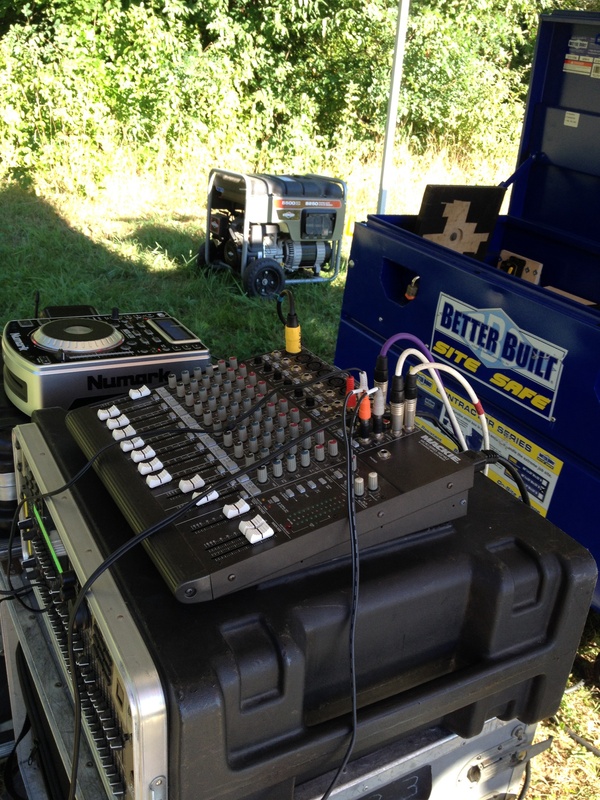 As a bonus … the Master of Ceremonies / DJ wanted to set up his system too! Perfect … This should drain the batteries in no time! Well … I thought it would! About three o’clock in the afternoon the DPW guys asked if we were going to need the generator … And with the inverter’s meters all showing 90 – 100% full … I let them take it … They had a longer day going than I did … And I was not going to need it by the end of the event. Even with all that gear running for 6 hours the battery meters still showed full … This was just not making any sense … with the kill a watt meters recording a little over 5 kWh of power used … Without putting much of a “dent” in the battery reserve! My intuition was starting to tell me not to believe the inverter battery meters. I needed to find out what was going on … Before running out of “juice” somewhere! Hmmm … I wonder if AAA would give me a jump start! This entry was posted in Uncategorized and tagged Elma Lewis Playhouse, Inverter, Outdoor concerts, Portable power, solar on August 15, 2014 by zekibeejr.